Yeah. That’s a gorgeous cover. I wrote some time ago about a few games I’ve supported on Kickstarter, and how I felt fortunate that the games even came out. It was a bonus that the games were also good; it can be really difficult to gauge how the final product is going to come out, years after the whole thing is over. There have been other, more random things I’ve thrown money at on Kickstarter. Indie films, theater productions, a comic book store that needed the rent for a new space. Once, a tactical pen that I got as a Christmas present for my brother (he’s a park ranger and anything “tactical” is kind of an inside joke for him and his coworkers). But the decision to support a game magazine- an actual, literal game magazine, just a few years after Nintendo Power folded and during a time where I get literally all my news online- was an anomaly. Spurred partly by nostalgia, partly by the promise of something unique, but mostly by a desire to see someone do something I’ve always wanted to do, I threw down for A Profound Waste of Time. My copy of the magazine arrived last week and I’ve been consuming it piecemeal. It’s a gorgeous piece. The creative director and editor, Caspian Whistler, had a vision in mind in putting the magazine together and I think it’s largely been fulfilled. There are no ads in the magazine, which already sets it apart from any other game magazine that has ever existed. The book is very thoughtfully composed. Whistler went out of his way to commission art from graphic designers and artists from all different industries and the result is a magazine that drips with aesthetic beauty. The actual written content is less obvious than “exclusive interview with [X] developer to talk about [X sequel game]!”; instead, it’s a collection of pieces that are thought-provoking, funny, or downright emotional. My favorite so far is an essay by Ashly Burch (of Horizon: Zero Dawn and Life Is Strange fame) about grief. It’s heartbreaking, and written very honestly. She’s been through it and knows how to talk about it eloquently, something I’m still trying to figure out for myself. People are so much more than the things they are most known for, and I really appreciated Burch’s vulnerability in her piece. It’s something to strive for not just in my own writing but in how I interact with people in general. 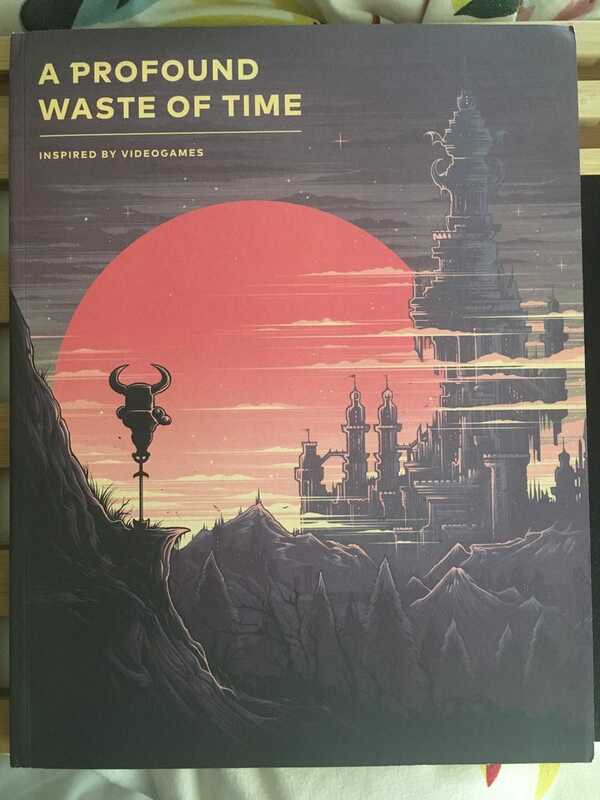 The big draw of the magazine is an inside look at Yacht Club Games and the creation of Shovel Knight and it’s DLC. If you’re into indie game development and the million unexpected trials that come up during it, it’s definitely worth a read. The team is open and honest and willing to share. Ultimately A Profound Waste of Time is exactly my jam. It’s weighty without feeling serious, fun without being trite. The art is amazing. Whistler’s editorial sensibilities make me think about my own choices and how I collect information. Most of all, it’s heartfelt, a real labor of love. Whistler kept updating his backers over the entire development of this magazine and it made me feel like I was backstage during rehearsals. I loved seeing the behind-the-scenes material and now having the finished product, it makes me appreciate the sheer improbability of the whole situation. In his forward to this first issue, Whistler talks about how he’s always been a little leery of sharing his love for video games. He always believed that they mean more to people than just a diversion, but he had trouble expressing it. Now, he’s in a position where he can. Reading that, I was struck my how much I identified with the sentiment. I’ve always loved games and struggled to express what that means to people; now I’m in a position where I write something about games every day, and even sometimes get paid to do it. Trying to make a living out of something that you love can be incredibly daunting but projects like A Profound Waste of Time make it seem possible. A new gaming magazine? In 2018? That doesn’t focus on reviews and previews? Can such a thing exist?